It would not be an exaggeration to say that Andrew Januik has winemaking in his blood. Januik is the son of Washington winemaker Mike Januik (Januik Winery and Novelty Hill), who has been making wine in Washington for thirty years. Andrew Januik first became involved in Januik and Novelty Hill in 2000 at age 13, helping out on weekends and during the summer. Come 2004, he worked his first harvest. After graduating from the University of Washington in 2009 with a degree in Spanish and Portuguese studies, Januik traveled abroad before starting work at Januik/Novelty Hill full time. At the winery, he does laboratory work and is also involved in blending and other stylistic decisions. “We’re still at a size where you can wear all hats,” Januik said. 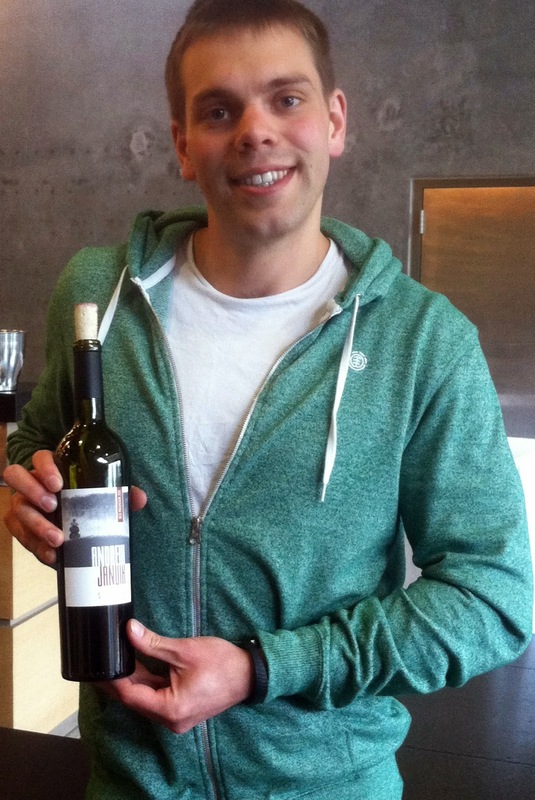 Earlier this year, Andrew Januik launched his own eponymous winery. “It’s something that I’ve always wanted to do,” he said. Januik’s first release is a 2011 vintage Cabernet Sauvignon from Red Mountain. He said that the decision to focus on Cabernet Sauvignon starting out was easy. Januik named the wine the ‘Stone Cairn Cabernet’ after the stone markings people make in the backcountry to mark a trail. “I backpack and hike a lot,” Januik explained. “I wanted something that had some meaning but also had a Red Mountain connection.” A picture of a cairn adorns the label. While Januik said that his style has certainly been influenced by his father, he also said he has his own preferences. “We are on the same page but not always on the same sentence if you will,” he said. In particular, Januik said that he preferred wines that were a bit lower in alcohol and that also had a particular feel. “I like a wine with a lot of suppleness,” he said. Though he intends to grow the winery, Januik noted that his winery will remain a side project for the time being. “My main focus is still the Januik/Novelty Hill brands,” he said. (Excellent/Exceptional) A moderately aromatic wine with an appealing profile of dark cherry, cocoa, vanilla, and spice. The palate has a very supple, seamless feel with a pleasing sense of tension between the acid, fruit, and tannins, bringing along a good sense of Red Mountain’s structure. 94% Cabernet Sauvignon, 4% Merlot, 2% Cabernet Franc. Aged in approximately 50% new French oak. 14.2% alcohol. 200 cases produced.